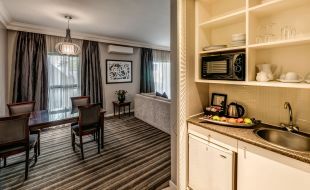 Southern Sun Katherine Street is the ideal choice for long-stay business and leisure travellers in Sandton. The hotel is centrally located on the boarder of Sandton CBD with easy access to the highways (Midrand and Woodmead) and is within walking distance to Athol square offering a variety of restaurants and food stores. The hotel offers 48, one bedroom and 4 two bedroom suites, each with a fully equipped self-catering kitchenette with separate dining and lounge areas. Each suite either opens onto a balcony or small garden area for those suites located on the ground floor. Long stay guests have access to the beautiful hotel swimming pool and lounge area which opens onto the terrace overlooking the pool and manicured gardens, guests can enjoy lunch and dinner at Kelsey's restaurant which offers a variety of contemporary cuisine from grilled steaks to fresh fish. A complimentary shuttle service is available to transfer guests to the nearby Nelson Mandela Square and the Gautrain station. Safe and secure off-road parking is available at no extra cost.